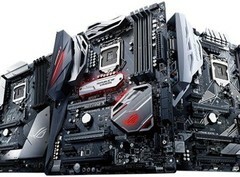 Asus claims its PC builder business (mainly the motherboard sales) has suffered due to Intel's 14 nm CPU shortages. Overall profits have seen a 39% year-over-year decline and the next few quarters will continue to hit Asus's profits, as the shortages are expected to last until Q2 2019. The gaming PC and server businesses are unaffected by these problems, however. Intel admitted in its Q3 financial report that the 14 nm CPU shortage will get worse throughout the last quarter and could be extending into 2019. The company is focusing on finalizing the 10 nm node and some 14 nm fabs have already transitioned to 10 nm nodes, causing the ever-increasing shortage for some desktop and notebook Coffee Lake CPUs. This situation is problematic not only for Intel, but for OEMs like Asus who have experienced profit issues in the last few quarters. Asus CEO states in a recent DigiTimes report that the Intel shortages caused the Taiwanese company to experience decreased shipments for the desktop builder community (most notably motherboard shipments). Shen claims that the shortages will extend into Q2 2019 and notes that the “operational visibility” for Q4 2018 is expected to hit an all time low of 20%, down from over 50% in previous years. Apart from the Intel shortages, other important causes for this steep decline are the U.S. – China trade wars and the increasing laptop competition in the European region. Server and gaming PC shipment, however, should not be affected by any of these problems. First three quarters have seen a 39% decline in profits compared to the same period of the previous year. Q3 2018, for example, had 43% decreased profits year-over-year. As far as Q4 predictions are concerned, Asus expects flat shipments for the desktop PC sector, even with the holiday shopping spree coming in a few weeks. Component shipments will be affected too, but only by around 5%. Intel could be causing even more problems for OEMs if it cannot deliver the 10 nm CPUs by Q3 2019. Meanwhile AMD is gaining substantial market share, and this could prompt OEMs to switch sides.